With that rush for school prep, we tend to see a shift in the real estate market.. it gets a little quieter with the summer distractions. So was that the case in July for the Portola Hills community... To a certain degree yes. The average days on the market are increasing, as buyers have slowed and inventory jumped a bit in July. Currently there are 15 homes available in Portola Hills. 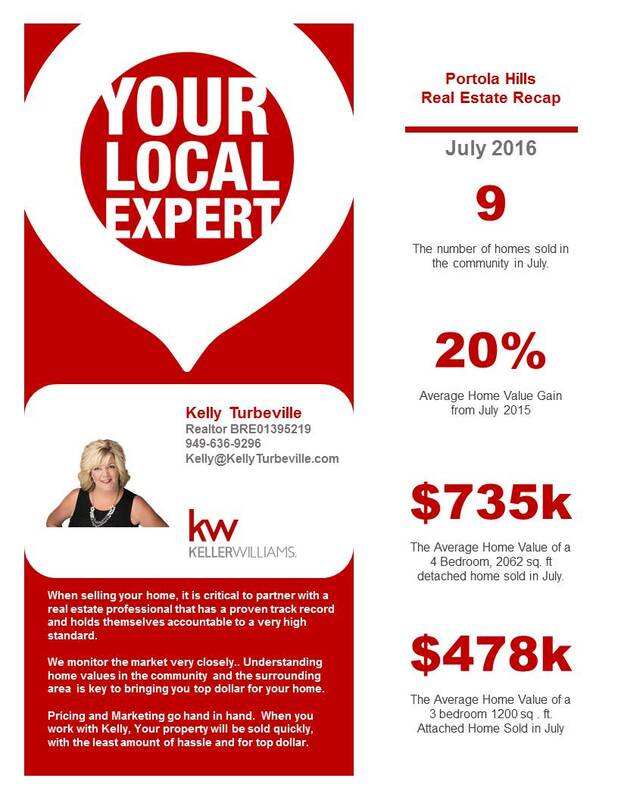 Below is a quick look at how the Portola Hills real estate market performed in July 2016. The average price per square foot in July 2015 was $306. The average price per square foot in July 2016 was $380. That equals a 20% increase in home values for the area. Of course, it is important to look at the overall market and what the mix of homes that sold are but the numbers always give us a clue. Understanding the market as a whole within the community, as well, in the surrounding area is key to determining the fair market value of your home. I have to admit, I sometimes look at homes and wonder why is that priced sooo low... Timing, Condition and Marketing are also a key in determining a price that will bring you a successful buyer. The inventory over all is still pretty low for the area but we have seen a slight increase. Homes priced below the median of $700,000 are still selling very quickly and with multiple offers. The average days on the market in Portola Hills in July was 46. If your home falls within that range you may want to take advantage of the tight market. On the higher end range homes are selling however the days on the market have increased, with the average days on the market about 79. If you are wondering if now is good time to list your home, please do not hesitate to give us a call so we can review how we perceive the market.